I am sure that for many of you; the weighing scales hold a lot of power! There was a really interesting article in the national press last week that gave some fascinating observations about our relationship with the bathroom scales. Goodness knows how scientific these surveys are (this one was done by Splenda on 2000 women) but I guess we do get an insight into people’s behaviours. One in five women say they are obsessed with their weight and weigh themselves once a day (they didn’t actually ask the question about how many times a day! It is many for some I know!). The number on the scales has become a way of judging our worth and value. The problem is; can you really win? If your weight has gone down, you might feel temporarily elated, but then quickly go into panic mode about a)either sustaining this or b)fear that you are losing control. If you weight has gone up, you are probably going to feel fat, greedy, unhealthy; anxious etc. There was more! Here are some things people do before they get on the scales in an attempt to lower the reading and to feel thinner. 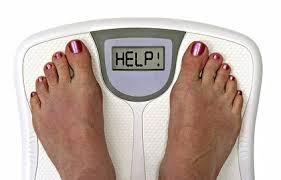 Reading it here, doesn’t it seem ridiculous that so much value is placed on getting the ‘right’ number on the scales? And think about the repercussions for the rest of your day? Are you set-up from this point to be in a calm and happy mood? How are your thoughts going to be affected by that number? We may smile here, but the sad fact is that people’s lives are taken over by a preoccupation with weight and body image. Of course, we want to promote strong, fit bodies and a healthy weight, but not to the detriment of living. And then, how do people respond when the weight reading doesn’t match their expectations? What are the solutions? They throw out old scales and buy some new ones. What is your solution? Hopefully, none of the above. If you need some new self-caring and health promoting ones, I would love to work with you and to show you a new way. Get in touch and email me today. Fantastic, reading this everything is so familiar. I would really welcome the opportunity to work with you, I can totally relate to all of this.